If you want to grill at the big game, at the beach, or wherever the party is happening, then you're in luck. Featuring a 10,000 BTU stainless steel burner system and 200 sq. in. stainless steel cooking area the GrillPro Stainless Steel Table Top Grill is the perfect match for the griller on the go. Power, portability and style in one convenient package. This Broil Chef PRO-SERIES Built-In LP Gas Grill comes with four high-powered, cast stainless steel burners that produce 60,000 BTUs combined with a ceramic rear rotisserie burner that pushes out 12,000 BTUs of grilling power. 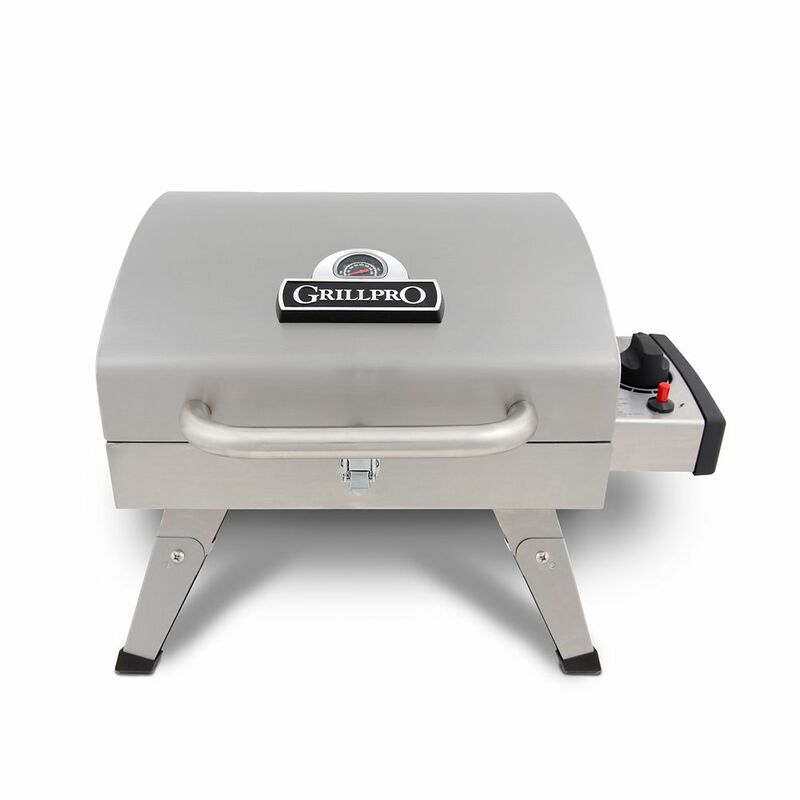 The 32-inch grill offers a total cooking area of 740 square inches (includes the warming rack), halogen lighting mounted on the interior canopy, and a hood with a heavy-duty thermometer to help cook foods perfectly every time. Whether you're grilling steak and asparagus or fresh salmon; you want the most delicious flavour possible. The Stainless Steel Barbecue Grill Box will outperform other grills because of its patented heat-diffuser plate and cast iron grill grates. The heat diffuser converts flame to infrared heat, evenly heating the cast iron grill grate so your meat is seared to perfection. Grease is vaporized, infusing your food with a rich barbecue flavour that cannot be achieved any other way. A temperature gauge is built into the stylish stainless steel lid for convenience. Features Stainless steel lid looks great, cleans easier and resists rust Fits all Camp Chef 16" stoves Removable cast iron grill plate Specially designed heat diffuser plates turn flame into infrared heat and instantly vaporizes grease drippings Lid damper valve helps control heat and smoke while sealing in the flavour Removable lid Lid handle for convenient opening Covers two burners on 16" Camp Chef Cooking Systems. Take your Pit Boss anywhere adventure leads with the all new Pit Boss BP100P. Fueled by propane, the PB100P is your portable grill solution. With a push button ignition, 10,000 BTU power system, a 305 square inch cooking surface and a side access grease tray, you'll have dinner cooked and cleaned up in no time. The PB100P comes complete with a sleek stainless steel body, cooking grids, a flame tamer and convenient foldable legs for easy storage. Whether you're tailgating for the big game or deep in the backwoods, the Pit Boss PB100P has your meal time cooking covered. Stainless Steel Table Top BBQ If you want to grill at the big game, at the beach, or wherever the party is happening, then you're in luck. Featuring a 10,000 BTU stainless steel burner system and 200 sq. in. stainless steel cooking area the GrillPro Stainless Steel Table Top Grill is the perfect match for the griller on the go. Power, portability and style in one convenient package.